The type of acoustic foam sound insulation you use in your Home Recording Studio will have an effect on the recordings you make. 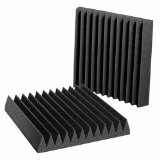 You can get good recordings without any soundproofing but with the right studio foam you can get Pro sounding recordings. And it will cost a lot less then what you think. The Auralex 2 Wedgie is a very popular type of soundproofing because it is a great overall performer. The 2 inch thick Studiofoam wedge treats most small to medium sized areas. They make great vocal booth soundproofing and will work great in a home recording studio treating small areas of your room. It very effectively kills standing waves and flutter echoes. If you used the Auralex 2 Wedgie in conjunction with bass traps or broadband absorbers you can effectively control the full frequency bandwidth in almost any size room. to get that Pro sound. Auralex Studiofoam Absorbers reduce uncontrolled ambience and allow your ears and microphone to hear only the source, not what's bouncing off the walls and ceiling of your room! Uncontrolled reflected sound is detrimental to accurate recording, monitoring or mixing. Studiofoam Absorbers, and all Auralex products feature superior performance, much greater longevity and terrific appearance.